Sid Meier’s Alpha Centauri is a sci-fi 4X turn based strategy game with plenty of depth to explore. The game also offers an expansion pack for the game (Sid Meier’s Alien Crossfire) which adds a number of features and factions to the game. It’s very easy to see similarities in the design Sid Meier’s Alpha Centauri and the Civilization series of games with similar designers, Sid Meier and Brian Reynolds at the head of both games. Sid Meier’s Alpha Centauri takes place in the 22nd century and presents players with 7 different (and competing) factions as they land on the planet Chiron, which is part of the Alpha Centauri star system. The game uses the same game engine as Civilization II and builds on it to create a similar but also innovative new experience. The game is jammed full of features from customisable units, native alien life, social engineering and even climate. In Sid Meier’s Alpha Centauri players will setup bases, create facilities, embark on projects, explore the map, research technologies, engage in diplomacy and of course conquer other factions. The game is split into squares that players can use to establish bases, get resources and even terraform squares to alter their function or resources. 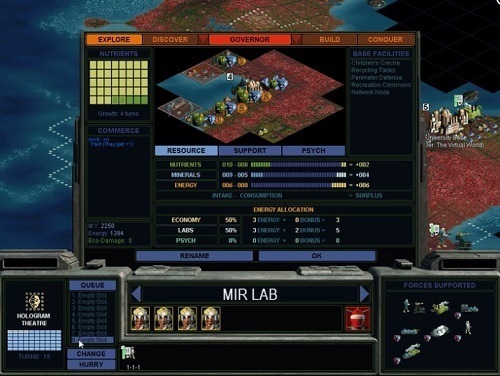 A unique game aspect in Sid Meier’s Alpha Centauri is the technology trees which grant players with new unit components rather than new units. This allows you to incorporate new technology into your current goals and units rather than make previously created structures and units obsolete. 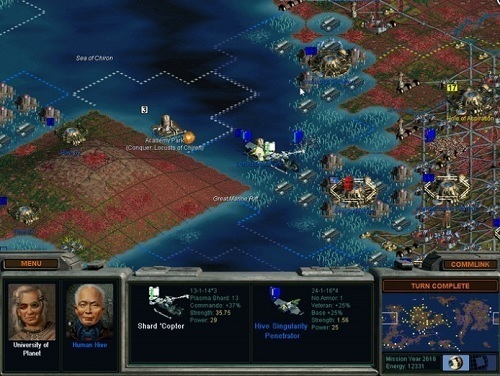 Sid Meier’s Alpha Centauri is both an enjoyable single player and multiplayer experience that is still one of the best turn based strategy games despite its age. So much strategy to absorb! An old and classic turn based strategy game. From the same mind that brought you the Civilization series. Unique factions with strengths and weaknesses. Greta storyline that helps immerse you into the game world.